Sr Maria Rosaria Tagliaferro, provincial of the Salesian Sisters of St John Bosco, last week was in Gozo where she met Laura Vicuna School students, the past pupils of Mary Help of Christians Oratory and also called on Gozo Bishop Mario Grech. Sr Maria Rosaria, who lives in Naples, also spent some time with the Salesian community in Sliema, where she met the Salesian Sisters, a group of young people from the Salesian Oratory and Youth Centre who prepared supper for her at the Sisters’ convent. While in Malta, Sr Maria Rosaria met the provincial of the Maltese Salesian Province, Fr Paul Formosa. 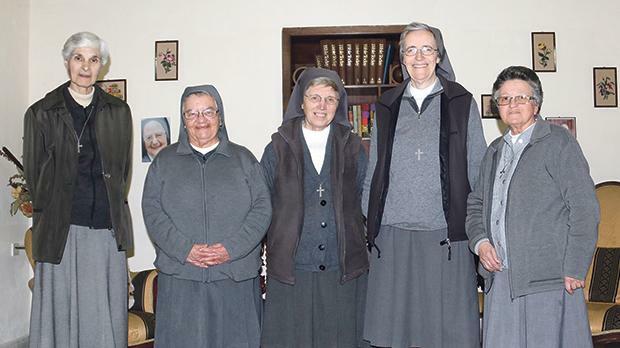 Seen here are Sr Maria Rosaria Tagliaferro (second, from right) with, from left, Sisters Ines Bonello, Stella Spiteri, Elsa Gretter and Antoinette Pace.